Some coaches like me to do a diary each year and post our practice plans which are based on the ABC philosophy. This year I am coaching a U18 Midget Elite Girl's AA team that plays in the Alberta Provincial league consisting of 12 teams. 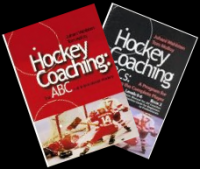 The purpose of this site is to continually update the coaching manual and add ABC coded practice activities. A - Individual skills and skating. B - Partner and team skills with no opponents. C - Game situation drills where you are trying to score vs. opponents. D - Games to teach the game. DT - Transition games where the C drills are practiced as continuous games with no whistles. E - Shootouts and contests. T - Coach directed training. T2 - Team offensive skills. T3 - Individual defensive skills. T4 - Team defensive skills. The coding also tells where the drills are done on the ice and can be combined. This makes it easy to find practice ideas. I will post the practice plans as the year progresses. We started with a conditioning camp and I did two evenings with three groups per night. 8:45 Parents and players meet coaches in the lobby. I have attached the pdf. with youtube video of most of the drills up to the start of drill section 15. The playlists have the new drills. YouTube video hockey drill and game playlists by country and level of hockey. We had a pre-season tournament to finish choosing our team. Played 4 games and won all 4. Lethbridge, 4-2, Team from Northern Alberta 9-1, Okanagan Hockey Academy 3-1 and Edmonton 2-1. We had to go from 7 to 6 D and 13 F to 11 F. Not fun for anyone but we cut down to the required numbers and now have our team. The players not chosen are our affiliates. The games showed us what we need to focus on in practice and let us get to know the players better. Great group. Watch for the forecheck principles. https://www.youtube.com/watch?v=S9IJatAFY-Q Hitchcock on aggressive hockey. This is a review of Team Play using table top hockey players with magnets for skates and a metal rink about the size of a kitchen table. I got the board at a Hockey Canada coaching symposium in Toronto in 1996. The company doesn't make them anymore but it is a great 3D way to go over team play. Format of scrimmage: It was a 75' ice time. 10' warm-up, 10' 5-4, 10' 4-5, 10' 5-3, 10'-5-3, 10' 6-5, 10' 5-6. After each segment the clock is reset and the players come to the bench for a 3' review with the coach and then play for 7'. Straight time. Key to success: Special teams are “Special” teams within a team. Pressure the puck carrier. Pinch on the weak side. Lots of skill work then Wally Kozak did a lot of work on defensive zone coverage using the Bob Murdoch sequence starting with a tight 2-1-2 with two strides and stop then progressed to aggressive dzone. Power Play Review and focus on the slap shot as a fundamental skill for the one timer. Review defensive zone coverage, skating edges and balance with Randy Cave, 5-0 breakouts, 3 games on two nets at goal line. We also practiced Dec. 6 but I was sick and stayed home and my assitant coaches ran a practice where they focused on puck handling, passing, power play and quick puck support. Dec. 7 Wally Kozak did a great breakout sequence again for the players who missed it last week. We have six injuries and some are coming back. I will put it together when I get a chance but it is very workthwhile. Played an away game Friday night. Won 1-0 with only one goal on 30 shots. Shots were 30-18 and we didn't put in most of our chances. So Saturday's practice 12-9-17 had a lot of focus on scoring and attacking with speed. Dec. 8 lots of passing and going to the net, shooting and scoring. Dec. 12 the focus was on the breakout with introducing a great breakout sequence with lots of reps. Learning to skate to the big ice between the dots and create a 2-1 by taking the ice behind. Lots of 2-2 situations. December 13 - Lots of passing, breakouts, power play game, cross ice games of Jokers behind the net must shoot. 3-2-1 pucks, backchecking, pass to Jokers on the sides. 2-1's, 2-2, 3-3. 1-1, 2-1, transition game 2-1 to 3-3. Shootout game 2-0 x 2. December 18 - Passing, scoring and shooting at full speed with a quick move then release. Batchko one zone, 2" game 2/3 ice, shootout, multiple passes. Game situations, passing, angling, loose puck battles, transition 1-1 to 2-2 and 2-1 to 3-3, Game sequence of 3-0, 3-1, 3-2, Batchko 2/3 ice. Lots of passing, one timers, defensive skating technique and backward striding, 1-1, 2-1, two one zone games, one with the 2" rule and the next Batchko, Perry Pearn 3-3. We have finished the first half of our 26 game schedule. We were 3-3 our first 6 games and won 6 of 7 after so we are 9-4 going into the Christmas break. It took a while for the players to adapt to a new way of playing and at the start of December we introduced the 'offensive swarm' where we outnumber the opponents on loose puck battles. This adjustment has improved our scoring by about a goal a game and now we usually get the critical 3 goals it takes to win consistantly. Our defense is very good but we lost some 1-0, 2-1 games and scoring 3 makes a huge difference in the final score. The simplest way to explain the 'offensive swarm' is to play like you are on a power play during loose puck battles. If they have one player battling we have two, them two then we have three. We play our aggressive forecheck with pinching on the weak side until a loose puck battle starts. Assistant coaches ran the practices 1-5/6-18 while I was in Jasper doing a camp for their hockey association. They focused on lots of passing and skating skills to get the players back after the Christmas break. The Dec. 28 practice was the only one that week. Some players were on Christmas vacation and two players who used to play for me asked to practice because their teams had no ice time. January 1 was a team play review practice with breakouts at the start and defensive zone coverage then forecheck and backcheck review. So the 5-5 was covered. Next day we did the 8 hour bus ride to Grande Prairie which took most of Saturday. We stayed over night and the team went bowling and watched the second period of the Flames-Ducks game in my room. We played Sunday and it was 1-1 and we lost in the shootout. 38 shots for and only one goal. All times are GMT. The time is now 00:31AM.